"I greatly appreciate your willingness to step in on such short notice and prepare a thorough and well reasoned expert report." My martial arts background is primarily Uechi-Ryu Karate along with a mix of other martial arts that I have studied since the age of thirteen. Always fascinated with combatives, my first experience with organized sport fighting was during my freshman year in high school when I began Greco-romanwrestling. During that same year I began a study of Uechi-Ryu Karate which I have now practiced for over thirty-one years. I earned my Shodan (first degree black belt) in 1983. I was a Director of the Florida Institute of Martial Arts, Inc. (FIMA) a 501c(3) not-for-profit martial arts school which hosted several styles of martial arts including ju-jitsu, judo and karate classes. Since then I have progressed to the rank of Rokudan (6th Degree Blackbelt) and Renshi (Master)in Uechi-Ryu Karate and 5th Degree inWashin-Do Ju-Jutsu. My rank has been affirmed by the WKF (World Karate Federation) and the International Uechi-Ryu Karate Federation. In the Summer of 1984, after five continuous years of State kumite (fighting) championships I was invited by Karate’s NGB (the USAKF), to participate in the TEAM USA selections being held in Ripley, West Virginia. The USAKF was the National Governing Body in sport karate for the United States Olympic Committee (USOC). At seventeen I was the youngest competitor ever to be invited to participate in this prestigious event. I attended the event and after a week of competition, I was selected to represent the country as a member of TEAM USA. I fought competitively throughout the world for the next ten years representing the State of Florida and the USA before making the USA World Team in 1994. I competed in the WKF World Karate Championship in Kota Kinabulu, Malaysia. and retired from competition the following year. My primary disciplines of karate and ju-jutsu were further augmented with continuous training in Kodokan Judo and Aikido which was taught alongside my karate training at the Florida Institute of Martial Arts. I continue to practice these skills which have served as the foundation for many of my original law enforcement training programs. When I became a police officer in 1986, it was a welcome change from being a ‘bouncer’ at a local college bar. At that time, I felt that the only real skill I had was in subject control, so it seemed natural that I would gravitate to the types of work that allowed me to do that. I will tell you candidly that I never really thought about being a ‘cop’ as a kid. It wasn’t until I ended up teaching a few of them in my dojo that the interest and intrigue of the profession drew me in. In fact, my first desire to enter the academy had nothing to do with wanting to become a law enforcement officer. I wanted only to be a better trainer of law enforcement officers. Having some level of notoriety due to my US TEAM status, I was immediately recognized and courted by the academy staff while still in the police academy, to “help out” with my own groups defensive tactics block. 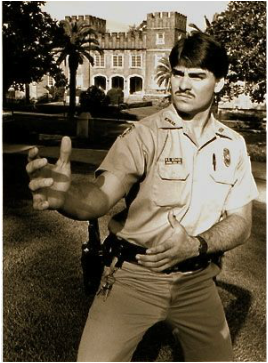 I was hired as an academy instructor in defensive tactics even before becoming a police officer. This was definitely the turning point in my life’s ambition and ultimately my career. The competitive travel circuit was giving me an opportunity to network with other martial artists from all over the world and it was opening my eyes to some of the ‘reality’ of combat. I am cautious using that word, since it means many different things to many different people. For me I was able to understand that the mystery of martial arts, it’s esoteric qualities and fantastic reputation; steeped in stories of mysticism, magic and the common claim of spiritual intimacy with the supernatural world… was far simpler than the martial arts marketing geniuses would have me believe. Already then I was shedding the blanket of mysticism that was wrapped around my mind – some of it from my direct instruction, some of it from hearing and repeating things that others had told me. My experience in fighting Internationally taught me that no nationality had a claim on martial excellence, and that technical prowess was found in hard training, not in the genes. I have been both beaten and have done my share of beating martial artists from nearly every culture and country. I discovered while traveling that there are no martial arts gods – no perfect techniques, and no absolute answers to the solution of human victory or survival. As I began training police officers, I was forced to look at combat differently than I had ever done in the past. I was now dealing with professionals who might actually use the techniques I taught. It was an amazing weight on my shoulders. The consequences of my tactics actually working were extreme. For me there was no more promoting anything that couldn’t actually be demonstrated and performed. For me the stories of the old sages who lived on the hilltop working miracles with their mystical martial skills were gone. This was my dose of reality and I took on the task of re-inventing my philosophy about defense and re-looking at what was actually important in combat training. In economic terms I became a ‘demand side’ instructor rather than a ‘supply side’ instructor, focusing not on what I knew as an ‘expert’ but rather on what others needed to know to win their battles. I looked at why cops won and lost in order to identify common characteristics and themes of victory. I looked at the physiology of technique and how it would best be executed if you added the elements of stress. I looked at performance based upon non-optimum conditions and tried to craft a philosophy about combat that took into account the possibility of being seriously injured or even killed. My ideal archetype was now mortal, fallible and capable of losing. This was the biggest mental distinction between my old and new training method. Since then I have created programs, patented products , copyrighted materials and developed a business out of police tactics. It has been my life’s work since 1986. My reputation has morphed from being the Uechi-Ryu Instructor to being a Police Tactics Expert. My method of instruction today involves a calculated blend of karate, judo and aikido, flavored with bits of kobudo (classical weaponry) all encased in modern legal theory. In hindsight, I was a pratictioner of mixed mart arts (MMA) long before that term became in vogue. I have, unwittingly become eclectic in my approach to combat, which I now find amusing, since I was one of the die-hard claimants of dogmatic practice out of ‘traditional’ necessity. Today I intentionally incorporate ‘change’ into my method of instruction as new technology, new laws, new awareness and new demands are placed on professional combatants (i.e. cops, solders, security personnel). I am no longer just an ‘empty-hand’ enthusiast as I incorporate chemical agents, batons, dart firing stun guns, and firearms into my training regimen.